Many glaciers on Svalbard behave very differently from other glaciers worldwide. They advance massively for some years and then quickly retreat – and then remain quiescent for fifty to a hundred years – before they once again start to advance. One of the many dangers resulting from global warming is the melting of glaciers. To ascertain how this will affect sea levels in the future, it is important to know how glaciers behave. Five years ago, Professor Jon Ove Hagen at the Department of Geosciences at UiO affirmed in Apollon that the melting of the smaller glaciers in the Arctic was just as important for the rise in sea level as the melting of glaciers on Greenland. Melting in the Arctic is staggering. During three summer months, the Svalbard glaciers alone lost four and a half million tonnes of meltwater per hour. The Nordic Centre of Excellence in Arctic Research, Stability and Variations of Arctic Land Ice, headed by Jon Ove Hagen has studied a unique type of glacier found on Svalbard, which behaves quite differently from most other glaciers worldwide. These glaciers can remain almost quiescent for 50 to 100 years, before advancing at an unprecedented velocity for some years. Then they retreat once again and remain quiescent for a further fifty to a hundred years before suddenly advancing once again. "A better understanding of the dynamics of these glaciers will increase knowledge of how the tributaries of the large glaciers on Greenland and in the Antarctic behave. This will enable us to predict more accurately how much sea levels will rise when these glaciers melt," says Jon Ove Hagen. These special glaciers are termed surging glaciers. In this article Apollon refers to them as pulsating glaciers. 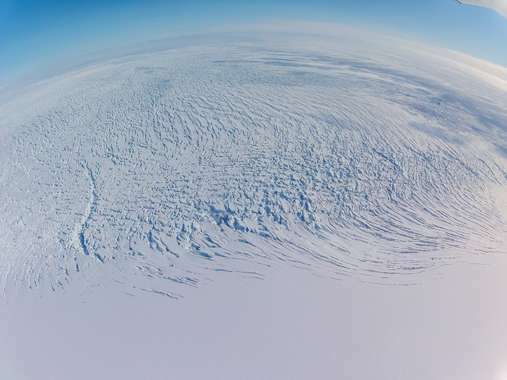 Pulsating glaciers behave so differently from the majority of glaciers worldwide that researchers have been attempting to explain this remarkable phenomenon for a considerable number of years. At least one of five glaciers on Svalbard pulsates. Globally, the number is one in a hundred. This means that pulsating glaciers are twenty times more common on Svalbard than in the rest of the world. Some glaciologists claim that as many as nine out of ten Svalbard glaciers pulsate. A 1993 glacier atlas estimates a total of a hundred pulsating glaciers in the period from 1860 to 1992, but many of these observations are imprecise. Only a few glaciers pulsate at the same time. In some seasons all of them may be quiescent. There are no pulsating glaciers on mainland Norway, or in the Alps. In contrast, some glaciers in Alaska and Iceland wake to life and move in the same way. Some of the glaciers on Greenland and in the Antarctic also pulsate. 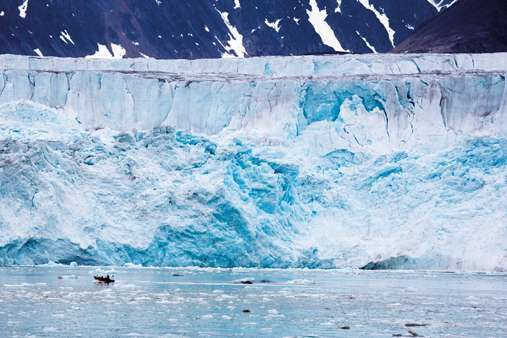 "Svalbard is therefore the best place in the world to study this remarkable phenomenon. These are living glaciers with their own special behaviour," says French researcher Heidi Sevestre. In her PhD thesis at the University of Oslo and the University Centre in Svalbard (UNIS), she has attempted to explain why these glaciers behave in such a strange way. All glaciers resemble a viscous mass. Because of the enormous weight of the ice, these masses flow slowly towards the ocean. Most large glaciers move a few metres on an ordinary summer's day. The classic glacier is the calving glacier. The glacier front ends in the sea, and blocks of ice detach and fall into the fjord. These glaciers are now receding faster and faster, and are continually losing more ice, like the Kongsbreen glacier innermost in Kongsfjorden near Ny-Ålesund. Over the last 30 years, the glacier has receded by five kilometers, i.e. 166 metres annually. The Nathorstbreen glacier in Van Keulenfjorden, 90 kilometres south of Longyearbyen, is an example of a pulsating glacier. It actually consists of many branches that join together to form one large glacier. In the course of a mere three years, from 2009 to 2011, the front advanced 20 kilometres. "At the most, the Nathorstbreen glacier has moved over twenty metres per day, or ten times faster than a normal glacier. All the ice that ends up in the fjord will gradually melt, resulting in the ice front receding," Jon Ove Hagen relates. But even though they are affected by climate change like all other glaciers, this is not the explanation for their pulsation. Normal glaciers move at a steady pace thanks to the high pressure exerted by snow masses on the ice caps. Pulsating glaciers are unable to move fast enough to dispose of the excess snow. Some of the upper parts of these glaciers become a few tens of metres higher before starting to spread. When they have become heavy enough, the enormous weight will result in the glacier sliding faster and advancing. The volume of the glacier will nevertheless remain the same. The Nathorstbreen glacier is 200–400 metres thick and 5–6 kilometres wide, thus consisting of many million tonnes of ice. The reason why this huge mass of ice can move over ten metres per day is that meltwater is formed between the glacier and its bed. There are two types of ice. One is cold ice with a temperature that is constantly below melting point. Friction against the glacier bed is therefore so great that the ice moves slowly. The other type is called warm or temperate ice. Here the temperature is close to melting point. When water is formed under the ice, the glacier slides more rapidly. "When the glacier becomes thicker, the pressure in the ice increases, resulting in some increase in temperature. At the bottom of thick glaciers, the ice is so warm that it starts to melt. The secret of such pulsating glaciers is therefore increased pressure from above. As long as the meltwater does not run away, the ice surfs on the water," explains Sevestre. When the meltwater under the ice drains off, the friction increases and the movement of the glacier comes to a halt. It is of most interest to study pulsating glaciers when their speed has increased, but at that time it may be extremely dangerous to walk on the glacier to put measuring instruments in place. "It is impossible to walk on glaciers that are moving fast. The entire glacier surface is a chaos of dangerous crevasses. The only period when you can study them properly is when they are moving slowly, but doing research at that time is of less interest. When the glaciers have started to advance, it is too late to find out anything about how the advance started," Jon Ove Hagen asserts. By a stroke of luck, the research group succeeded in placing five permanent GPS sensors on the south side of Europe's largest glacier, Austfonna on Nordaustlandet, some years ago, before discovering that the glacier segment with the uninspiring name Basseng 3 [Basin 3], was a pulsating glacier. The sensors were placed five to twenty kilometres from the glacier front, but unfortunately not on the parts of the glacier that moved at the greatest velocity some years later. The glacier began to move faster in 2009, and the velocity gradually increased every summer. Even though the velocity naturally decreased somewhat in winter, it doubled in relation to the preceding winter nevertheless. The gradual increase lasted for three years. In 2012, the movement of the glacier rocketed. The fastest moving parts of the glacier moved twenty metres per day, and the cracks were up to ten metres wide. The annual glacier calving rate for the entire ice cap of Austfonna is usually two and a half cubic kilometres of ice annually. Now the enormous ice discharge has tripled but this phenomenon is of short duration. "We have also observed on Greenland that the speed is increasing on many tributaries. We can therefore learn from Austfonna on Svalbard something about what is happening to other big ice caps and ice sheets. The key question is how stable the tributaries are in Greenland and in Antarctica. This can be of considerable significance for sea levels," says Hagen. To measure the movements and changes in the elevation of the glacier on Austfonna, both satellite measurements and GPS measurements on the glacier itself are employed. Previously, snowmobiles have been used to take radar measurements of the thickness of the ice. The glacier has become thicker in the central zones and thinner along the edge. Now it has become so dangerous that helicopters must be used to put measuring instruments in place. This past autumn, the glaciologists travelled to the Tunabreen glacier, which is located a little to the south of the Russian settlement Pyramiden. The glacier advanced enormously ten years ago but is now receding. Here the glaciologists have installed instruments on the glacier and a camera on the mountain to take photographs at regular intervals over a period of months in order to measure the speed of the glacier. They will also study the topography of the fjord. Heidi Sevestre has studied fifteen pulsating glaciers on Svalbard. The glaciers do not advance at the same time. While some are now expanding, others are receding. Thanks to satellite photographs, one can see which glaciers are changing. In the 1930s, Svalbard experienced a warm period. Then it grew colder – and then warmer again. Now the Svalbard glaciers are reacting strongly to climate change. "Even though the process in the pulsating glaciers strictly speaking has nothing to do with the climate, the climate may affect how often they advance," emphasises Jon Ove Hagen. In order to understand the movements of the glaciers, researchers must also take into account the volume of precipitation on the glaciers. Unfortunately they know little about local variations in precipitation. "Regrettably we have far too few permanent weather stations on Svalbard. There is one in Hornsund, in the very south of Svalbard, one in Longyearbyen, one in Ny-Ålesund and one in the very north of the archipelago. That's not enough. We need more weather stations. For the time being we have to use mathematical models to estimate the volume of precipitation on the glaciers,ˮ explains Sevestre.